Jools Barnett was born, and still resides in the quaint coastal English town of Leigh on Sea, Essex. He has always been a voracious reader and turned his hand to writing from an early age, fuelled by the need to express his creativity to a wider audience. In 2010 he graduated with a Law degree, and continued to dovetail writing alongside his studies, resulting in the development of the ‘Watchtower’ series of novels. The debut episode ‘The Start of Something Beautiful’ was published on March 1st 2012 on Amazon Kindle and is the first of 12 serialised novellas. These combine the sci-fi and thriller genres, coupled with generous helpings of ‘tongue in cheek’ humour. Jools is also a screenwriter and has worked on many independent films during the last decade. He enjoys listening to progressive rock music and playing the electric guitar. He is also an avid television and film buff and enjoys travelling and long walks along the coast (especially when confronted by writer’s block). When an anonymous box containing a human heart arrives for barrister Lucas Hayne’s birthday, he’s thrust into a byzantine rollercoaster of mystery, treachery and murder. Simultaneously, Lucas experiences his first precognitive incident from “The Knowledge”: a mysterious affliction, causing him moments of absolute clarity and understanding. Lucas initially rejects The Knowledge, and cannot face being the target of a sociopathic maniac, but the fiery detective, Paige Cartwright, desperately needs his help, as five years earlier, Lucas received a similar hearty gift. Lucas and Paige must unravel the mystery, force Lucas to face his demons and unmask the killer hell-bent on ruining Lucas’s life. 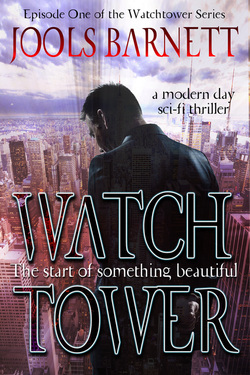 The Start of Something Beautiful is the first of twelve episodes in the first series of the modern day sci-fi thriller serial Watchtower. Thrilling plot twists, heart wrenching drama, and more cliffhangers than Beachy Head. Let the first of these 30,000 word novellas into your life, impossible to put down until you grab the next one.